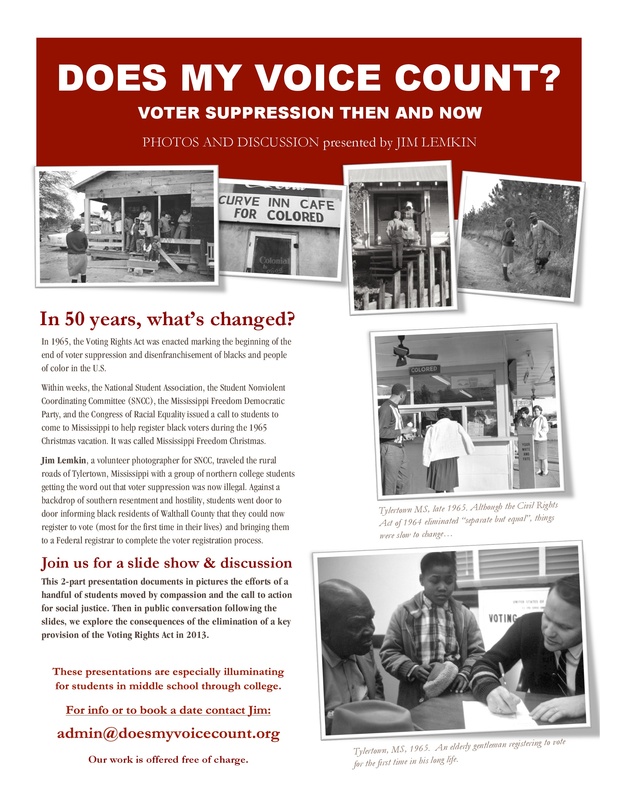 I am offering public presentations and conversations on the crucial issue of U.S. voter suppression and its remedies. In 1965, immediately following passage of the Voting Rights Act, I joined a group of northern college students in an effort to register African American voters in Mississippi. It was called Mississippi Freedom Christmas. I served as a photographer for SNCC (Student Nonviolent Coordinating Committee), a civil rights organization. The Act was highly successful in helping put an end to disenfranchisement of African Americans, people of color, the poor and disadvantaged. However, as you may know, in 2013 a key provision of the Act was struck down opening the floodgates for states to enact various new voter suppression laws. To date, hundreds of novel “legal” but suppressive state laws have been enacted in a majority of states that have served to again depress the vote of minorities and the disadvantaged. Last year, more than 50 years later, I discovered the photographs from Mississippi Freedom Christmas in an old trunk in my basement. As I was restoring them I realized that, in addition to offering a small glimpse into the history of the struggle for civil and voting rights, showing the images could serve as a public springboard for discussion about the all-too-urgent and present issues of voter suppression and the future of democracy. 2) A conversation on the strategies of voter suppression that have been implemented since the rollback of the Voting Rights Act in 2013. 4) Sharing of relevant resources for action to oppose voter suppression: Organizations, books, films, etc. These presentations have stimulated a lot of interest in the general public and in schools and are especially informative and fresh for students of nearly all ages. In every presentation there are very lively, passionate audience conversations. At every event I issue a call to action and pass out a printed discussion with resources, (see VOTER SUPPRESSION THEN AND NOW). I am not an expert in the field of voter law or history, but simply the voice of one person drawn by simple respect for basic human dignity and the need to help correct social injustices that are ever-present today. I represent neither official Republican or Democratic Party views — just human views. I am holding public conversations at schools, libraries, performance spaces and other venues in New England, the West Coast and elsewhere. The presentation is free to all. If you have interest contact me about setting up a time for an event and possibly also an exhibit of photos with descriptions. The presentation is adaptable and can easily fit the requirements of the any interested group —from a single class period or assembly up to two hours or more. I can also hold distance conversations by Skype, Facetime or Zoom. I am glad to provide good quality historical images for publicity and flyer PDFs. If you can think of other persons or any venue that might be interested in learning about voter suppression would you kindly forward this information to them?